I have seen recently more suggestions that the term, “Flying Saucer,” is a misnomer because Kenneth Arnold wasn’t describing the shape of the objects he saw but their motion through the air. 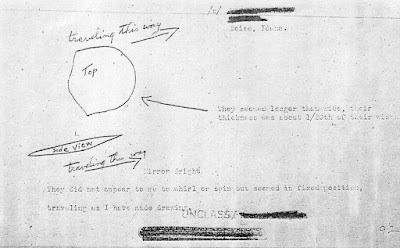 Reports from June 1947, however, seemed to indicate that some objects were saucer shaped, and others, who were busy misidentifying mundane objects, whether natural or human constructed, began talking of flying saucers regardless of shape. It is a point that I find interesting. When I was working on The Government UFO Files, I tried to track all this down. Looking at the newspaper reporting, at the Project Blue Book files, at the documentation that came from APRO, NICAP and other organizations, I tried to find any story published prior to June 24, 1947, that mentioned disk-shaped or saucer-shaped craft. I found virtually nothing. There were many stories in the newspapers after Arnold about strange craft, and many of them referred to flying saucers even when the object reported was not saucer shaped. The term became a catchall for anything that people had seen and had been unable to identify. The best seemed to be a report in the newspaper from Cedar Rapids, Iowa, that predated Arnold, but the truth was that while it seemed the man had seen the objects on June 24 (as best as I can figure) it wasn’t reported until days after Arnold so was no help in my quest. You can read about it here. A weather bureau observer at the Richmond Station observed on three different occasions, during a six month period prior to April, 1947, a disc-like metal chrome object. All sightings were made through a theodolite while making pibal [balloon] observations. On the last reported sighting, the balloon was at 15,000 feet altitude, the disc followed for 15 seconds. It was shaped like an ellipse with a flat level bottom and a dome-like top [emphasis added]. The altitude and the speed were not estimated, but the object, allegedly through the instrument, appeared larger than the balloon. Another observer at the same station saw a similar object under corresponding circumstances, with the exception that her balloon was at an altitude of 27,000 feet and possessed a dull-metallic luster. There was good visibility on days of observation. Report of this sighting was not submitted until 22 July 1947. AMC Opinion: There is no readily apparent explanation. If there were only one such object, it seems amazingly coincidental that it would be seen four times near the pibal of this station only. On the other hand, there would have to be a great number of these objects to rule out coincidence, and as they number of objects increases so do the chances of sightings by other witnesses. Project Astronomer’s Opinion: There is no astronomical explanation for this incident, which, however, deserves considerable attention, because of the experience of the observers and the fact that the observations was made through a theodolite and that comparison could be made with a pibal balloon. The observers had, therefore, a good estimate of altitude, of relative size, and of speed – much more reliable than those given in most reports. This investigator would like to recommend that these and other pibal observers be quizzed as to other possible, unreported sightings. This series of reports, made by Minczewski, are not mentioned in the Project Blue Book Index, which lists only a couple of reports made prior to the Kenneth Arnold sighting. All were reported after the press coverage of the Arnold sighting, so there is no way to document the actual date of the sighting. As early as the middle of April 1947, at the Weather Bureau in Richmond, Virginia, a U. S. Government meteorologist named Walter A. Minczewski and his staff had released a pibal balloon and were tracking its east-to-west course at 15,000 feet when they noticed silver, ellipsoidal object just below it. Larger than the balloon, this object appeared to be flat on bottom, and when observed through the theodolite used to track the balloon, was seen to have a dome on its upper side. Minczewski and his assistants watched the object for fifteen seconds as it traveled rapidly in level flight on a westerly course, before disappearing from view. 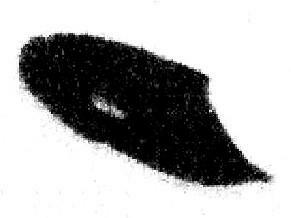 In the official report on file at the Air Force's Project Blue Book, at Wright-Patterson Field, in Dayton, Ohio, this sighting is listed as Unidentified. 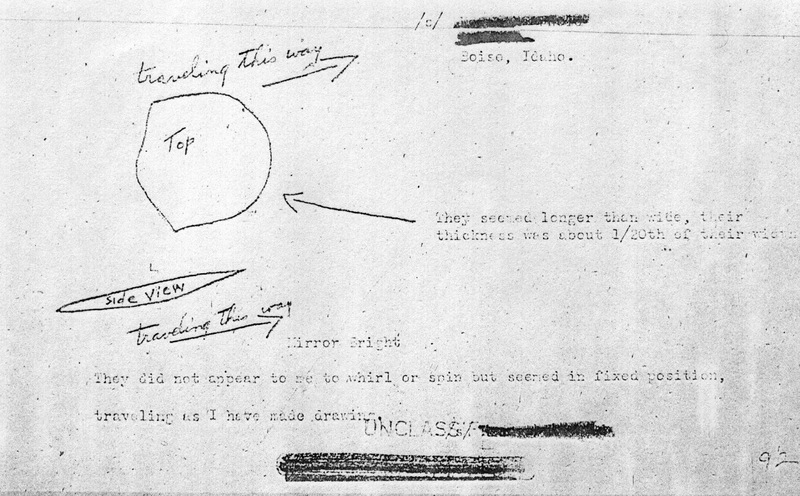 The point here is that we have a case of a disk-like object, and a date assigned by the Air Force about the sighting, but we have no documentation that I can find dated prior to the Arnold sighting. There might be something hidden away in the Weather Bureau records, or somewhere else, but I have nothing that pre-dates Arnold for this case. And before I hear of all those sightings of disks and saucers from early in the 20th century, I was looking for something in the months prior to Arnold. I arbitrarily set a year as the outside limit though I did look at the Foo Fighter reports. The Swedish Ghost Rockets in 1946 all seemed to be of something that resembled German vengeance weapons as opposed to flying saucers. While the claim that “flying saucers” are the result of bad reporting and people leaping onto the bandwagon, there is some evidence that saucers had been seen prior to Arnold but there is virtually nothing in the record to show these sightings were reported prior to Arnold. That might be because no one thought much about it until the Arnold sighting hit the national press, but whatever the reason, the point is, I could find nothing about a saucer-shaped object dated in the months prior to Arnold (and to beat a dead horse, I have the reports published after Arnold that refer to events before Arnold, but nothing in the newspapers or anywhere else published prior to it).